I don’t think I need to remind you that Justice J-Lo a/k/a Sonia Sotomayor said a “wise Latina” is “more often than not” smarter than a White man. Well, judge for yourself, and based on Sonia From the Block’s comments, below, in an important terrorism case, I think maybe you’ll come to the opposite conclusion. I used to refer to her as “So-So.” But, frankly, that was being generous. She’s rock bottom, and it has nothing to do with her ethnicity, but that she was put on the court strictly because of her combined ethnicity and female plumbing. On Tuesday, the U.S. Supreme Court heard oral arguments in a case deciding whether or not previous counterterrorism laws and a portion of the USA Patriot Act barring “material support” to parties the government has designated as terrorists, violates First Amendment speech rights. But that’s a cover. Those who filed and represent plaintiffs in the case, Holder v. Humanitarian Law Project, don’t give a whit about free speech or the First Amendment. They want to help terrorism supporters in America to carve out a way to finance them. All you have to do is look at the lead attorney, David Cole. He’s the American consigliere of Jihad, Incorporated, having represented such lowlifes as Mazen Al-Najjar, the Islamic Jihad operative and brother-in-law of Islamic Jihad founder and frontman, Sami Al-Arian. And he represented Popular Front for the Liberation of Palestine terrorist group members Michel Shehadah and Khader Hamide and saved them from deportation. He is a frequently featured speaker on the halal rubber chicken circuit. In this case, the plaintiffs are the PKK (a Kurdish terrorist group, whose operatives trained with Hezbollah and HAMAS in Syria) and the Liberation Tigers of Tamil Eelam (LTTE) a/k/a the “Tamil Tigers” in Sri Lanka. But let’s be clear–the real plaintiffs here are Al-Qaeda, HAMAS, Hezbollah, and every other Islamic terrorist group that would love to get the few less-than-watchful eyes of the U.S. government off their backs and make it even easier than it already is to raise money in the U.S. for their terrorist operations. Ostensibly, the lawyers, here, are arguing that, if there’s a disaster like a tsunami, U.S. citizens and organizations should be allowed to give tsunami advice and aid to terrorists. But that and similar excuses have already been used to funnel money to terrorist operations. That’s why they pretended Hezbollah money was going to Hezbollah “hospitals,” “orphanages,” and “children of the martyrs.” And it’s why these laws were put into place in the first place: because–newsflash!–terrorists lie, cheat, and steal . . . and they funnel money to terrorist operations that they pretended was for “humanitarian relief.” It’s an IQ test for Supreme Court Justices. If you fell for the “tsunami advice” argument–as at least two Justices, including Wise Latina, did–you failed. Suppose the group is not the two that we have here, but Al-Qaeda and the Taliban? 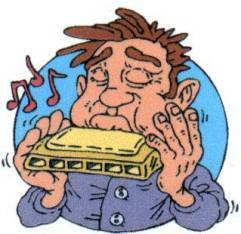 Under the definition of this statute, teaching these members to play the harmonica would be unlawful. Um, under the definition of this statute, teaching Bin Laden to blow his nose into a tissue, instead of digging for gold and eating it, would be unlawful, too. So sad, too bad. They are terrorists bent on destroying us, not seeking to learn how to play the harmonica. What an idiot. If this is a “Wise Latina,” I think Hispanics need to sue for malpractice and deceptive advertising. And blame Barack Obama for this. While his Solicitor General Elena Kagan is eloquently defending the terrorism finance laws, he appointed this intellectually-challenged Justice to the Court. Then, there’s the comment of the nearly-as-boneheaded-jurist, who voiced concern that the government could prohibit advice to a terrorist group on how to obtain tsunami aid or even file a legal brief. And the tsunami BS I’ve already addressed above. I wonder if “Wise Latina” would be dreaming up terrorists’ rights to harmonica lessons, if she or people Ms. Sotomayor knows and loves were their victims. Well, all the “wonder”–if there was any–has certainly evaporated on one thing: A “wise Latina,” at least in this case, clearly can’t come to a better conclusion than a White man. Not even close . . . unless you count her fellow imbecile-in-a-black-robe, Justice Kennedy. This is exactly why NO judge should ever be guaranteed a job for life. It produces arrogance, and leaves no way to remove incompetence. U.S. Supreme Court justices should be elected to 8 year terms. 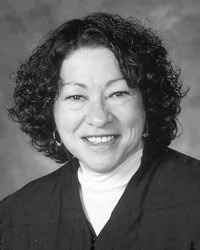 But who said Sotomayor was wise? A wise Latina being smarter than a white man? Only if she is talking about insane white men. We should compare her to the “dumb” founding fathers and the first Supreme Court, run by white men. I highly doubt anyone would say she is smarter than them, except for the PC racists we have in the WHITE house. You know,, I’ve gotta’ go with Sonia on this one. If “wise latinas” are so “wise”, how come LatinaLand – which is probably in possession of one sixth major resources in the world, including oil, how come Latina Land is a total sh!t-hole and all the Latinas – wise and not-wise, are running to the USA? Which was NOT founded by any Latina WHATSOEVER! Debbie, bravo! Brilliant line, that “So-So” was generous. But you have to give Rock Bottom (call her “Ro-Bo” or “SoRoBoSo”) one modicum of credit: she managed to conjure a straw woman — the “wise Latina” — and then arrogate to herself the mantle of that wisdom by pretending to inhabit the persona that she made. And she snookered so very many people too craven to oppose her, fearing that because she is Puerto Rican, they daren’t call her unworthy. Thats’ iffy on the plumbing part ???????? Switch Sotomayor with people like Debbie Medina and Steve King who are defending the IRS plane attack fellow Joe Stack and what do you have? Hmmmm …. Having studied the books of Daniel and St. John the Revelator most my adult life, I’m thoroughly convinced that we are in the very last days the End of the Aion. I’ve been preparing for this a long time. Went through my survivalist phase; my religious phase; my Oh, Well phase and the requisite being ticked off phase. I was prepared to be hunted by Storm Troopers, routed by trogs, slandered and j’accused by the worst sort of Leftist nanny staters, my neutraceuticals taken from me, my garden confiscated, beaten over the head with my own weapons, my property confiscated and even my family executed in front of me. … is for the End of the Age to be this flipping stooopid. I mean bone deep, eye popping, Holy Shiite flagrantly, insidiously, egregiously almost genetically STUPID. Just flat out stupid … nope. Missed that one. Geraldo Rivera, reporting on Fox News, stated flatly that many people consider her the smartest supreme court justice since Cardoza. She must be really good if even Geraldo holds her in such high esteem (right?). I’m actually glad that Obama picked her for the Court, and not someone more intelligent. Granted it is unpleasant to see such a lightweight on the Supreme Court, but on the other hand, with her idiocy, she is less likely to influence other justices (don’t know what happened to Kennedy; maybe he’s losing it). But she is less damaging than someone like Tribe would be. But I don’t think it’s just that she’s an intellectual lightweight. Lots of liberals don’t like what this country stands for, and consciously try to subvert it in any way they can. This may be magnified by her perception that Latinas are discriminated against, and that now she has a chance to get back at the evil oppressors. Lots of the so-called oppressed look at things that way. I am glad that she did not bring up accordion lessons. It was obviously a gender and ethnic pick. What other bizarre observations will she give us during her tenure? Andrew Joseph Stack was nothing but a coward, to his family, to god, to our country. Boo, hoo, hoo, I have money problems and its not my fault, it the big bad government. This domestic (white trailer trash) terrorist who first burned his house and crashed his plane into a building during business hours and killed Vernon Hunter a 27 year Federal employee and 20 year veteran of the US Army with two tours in the Vietnam War. What does a thread on Sonia Sotomayor have to do with that? Are you just posting your stuff randomly? Red Sonia never met a terrorist that she disliked. She only dislikes anti-terrorism laws. What a disgrace. Just pointing that some right wingers support/romanticize/sympathize with terrorists and other criminals like Joe Stack and Randy Weaver (remember how the Contract With America crowd brought Weaver to testify on Capital Hill back when that crowd was agitating against the ATF?) just like some left wingers do. I still remember the old days of talk radio when guys like G. Gordon Liddy were … oh well never mind. I think Norman is closely related to Wolf. You do remember Wolf on the game show, don’t ya? He was about as wise as Sotomayor. a Jewish Directory website, i think the it is very useful. For all you agnostics out there, Eva Longoria interviewed Sotomayor on TV, and the lovely actress sat on stage in absolute awe, as if she had witnessed a theophany and lived. The Wise Latina regaled Longoria’s miniscule brain with sound-bytes on jurisprudence, the US Constitution and general wisdom. Do you believe the Wise Latina’s stupid now? Maybe not as stupid as Longoria, but stupid nonetheless. She’s a Liberal scumbag, but I repeat myself.